For fast and cost-effective Ag protection. Your crops are one of your most valuable assets which deserve swift, safe and accurate care. Dangerous pests, frost, weeds, and other nuisances threaten healthy crops and their growth, so safeguards are a must. FairLifts reserves helicopter support through aerial application in Virginia, and helicopter operators who service the agriculture industry, experienced in high-quality agricultural care. There are plenty of options available to service your specific needs. We deliver safe and effective aerial applications in Virginia for both dry and liquid sprayings as well as mapping services. You can expect fast, and accurate application to protect your crops at a time of your convenience. Virginia boasts of 49,000 farms on roughly 8.1 million acres of land. Ranking top 10 in the US for agricultural diversity, it produces some of the largest stocks of products including tobacco, apples, grapes, peanuts, cotton, and tomatoes. 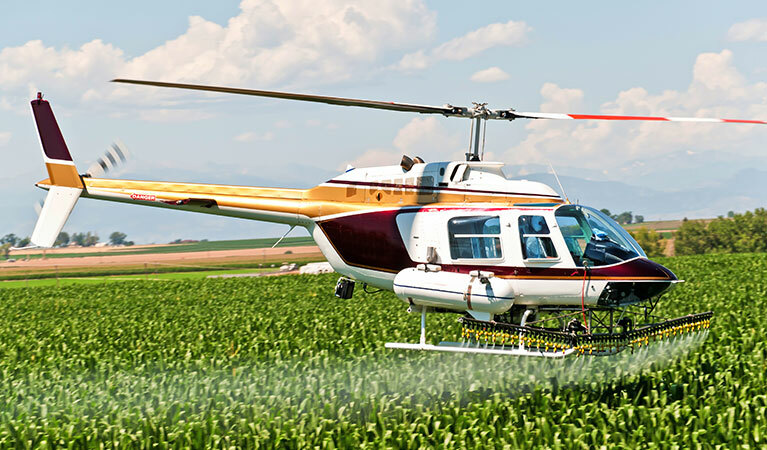 While laws are in place to protect the local residents of the state, aerial application remains the fastest and most efficient method of crop protection and nutrient management with a 3:1 advantage over ground treatment, which allows for spraying without touching the crops. Flow controls, technology, and land buffers ensure precise application, safety, and crop control. Elements, winds, pests and other hazards are often obstacles to healthy crops, but FairLifts coordinates solutions to these issues, to help maintain ag- integrity, and livelihood. Specific crop options from nutrient provision to aerial spray control can be scheduled with one of our service agents to protect your agriculture today. There is a solution to your specific crop treatment. Aerial crop spraying of wet and dry compounds have proven to be largely effective and efficient in agriculture. The benefits include helping maintain production of crops, keeping the surrounding soils rich, and reduces erosion due to the elements. You can choose to fertilize, hydroseed, or protect it all with a custom fungicide. Whatever the need is, our service professionals can plan and schedule everything necessary to keep your Ag production healthy. Mosquito and other pests can be as little as a nuisance or the cause of crop devastation. FairLifts works with experienced and professional helicopter operators who are able to access local areas and apply the right treatments for areas while maintaining safety for the surrounding areas. They have options to eliminate the threat of pest devastation with the tools for precise application of larvicides to target mosquitoes during the breeding season. It is a fact that healthy crops depend on a dose or two of Herbicide. Weeds sprouting up and heavy brush are detrimental to crop growth. Treating these issues from the ground level is very time consuming and less economical. Helicopter aerial distribution is typically a superior option due to time and cost saving, the amount of area covered, and accessibility. This is the best and most effective choice, covering acres of land that would take several ground crews to complete. While the State of Virginia is referenced as having Goldilocks Climate, where the weather is never too hot or cold, the threat of crop frost is always lingering to strike in cold conditions. Hundreds of acres can be destroyed in vulnerable moments as vegetation continues to grow, but aerial frost protection can give you the advantage you need. 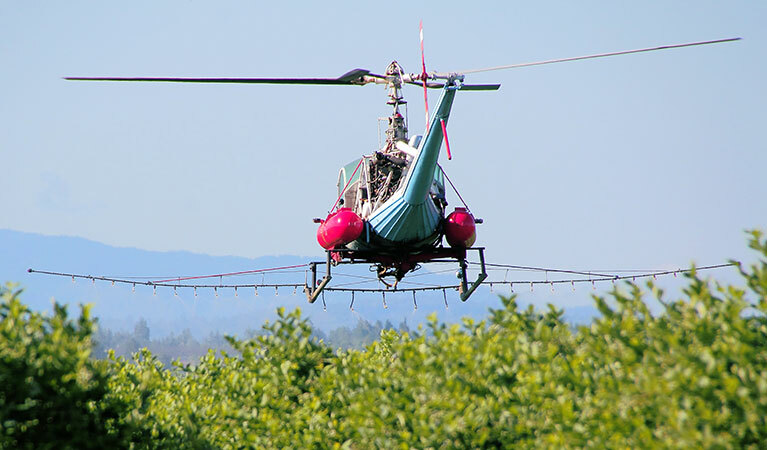 Spraying solutions or helicopter downdrafts blowing warm air over the crops is an easy and cost-effective solution for the cold climate. FairLifts offers the state’s most experienced operators in the industry available. Virginia's farmers, growers and producers can contact us seven days a week and rest easy knowing we provide the necessary advantages to help you produce quality crops throughout the year.